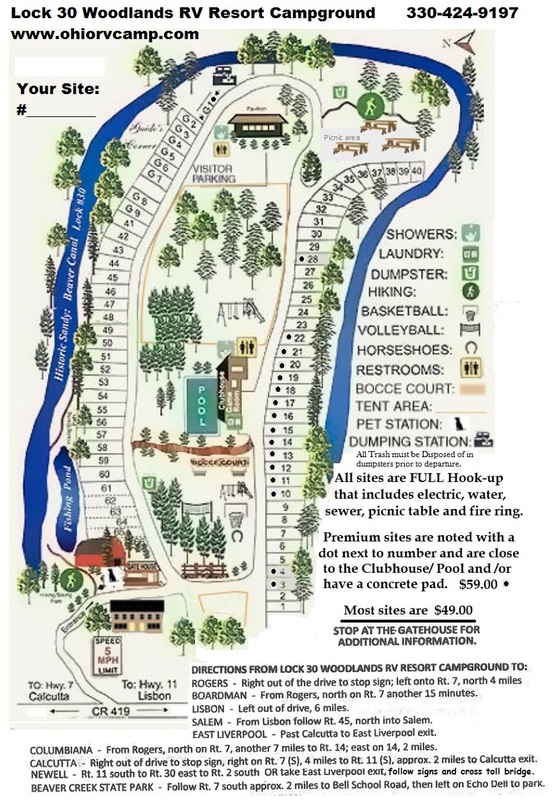 Lock 30 Woodllands RV Resort Campground is designed for maximum camping pleasure. Spaces are designed for triple slide-out RVs, some as long as 100 feet. A mile of Beaver Creek that’s Designated Wild & Scenic*, meanders through the property. You won’t see a single home or commercial activity anywhere from your RV site because this family property is surrounded by conservation easements. Wildlife along the riverfront corridor features dozens of bird species, including pheasants and wild turkey. Lock 30 Woodlands’s 68 acres includes both sides of the river and features vistas of forested sandstone hills, a 3.5 acre, stocked fishing lake and an original lock of the Historic Sandy & Beaver Canal—the only remaining lock on privately–owned property. RV sites with you in mind! Many FHU sites are open year-round, with individual water shut-off valves and convenient access to a heated, carpeted clubhouse featuring showers, restrooms, laundry and spacious game room with arcade games, pool table and free foosball.